Follow the Huddersfield 10k on Facebook at TheHuddersfield10k to keep up to date with race information. Our race is held on the last Sunday in February each year, with the last event taking place on Sunday 24th February 2019. The weather forecast in the lead up to the race suggested we were in for a chilly but dry day, which lived up to it's promise although bright sunshine warmed up the air. Continued use of chip timing meant we could manage up to 700 entrants, although this year were just short of reaching the entry limit as we closed for entries on Thursday 21st February. 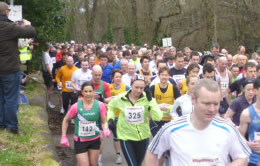 The race started at an earlier time of 09:30, but we still had runners entering from across the North of England. The men's (and race) winner was Chris Bevan an unattached runner in a time of 36:05 minutes, 47 seconds ahead of Meltham AC member Tom Whitworth who came in at 36:52 minutes. Third place was very close and went to Richard Herrington, an over 35 vet of St Theresa's AC who finished in 37:00 minutes. The female race was Laura Hesketh, an over 35 vet of Clayton-le-Moors Harriers. Laura finished with a time of 38:31 minutes. The second female was Fiona Davies of Rotherham Harriers, an over 45 vet who was last years female winner, in a time of 39:12 minutes. Third place went to April Caufield, an open category member of Halifax Harriers AC in 41:24 minutes. For 2019 we upgraded the t-shirt to a technical t-shirt rather than cotton with a new modern colour scheme and The Huddersfield 10k as the focal point of the design - the feedback we received has been very positive. Flaming Photography were out on the course and their photos can be found at www.flamingphotography.co.uk. Full race results for this and previous years can be found in the table below. Thank you to everyone who took part and we hope you enjoyed the undulating Yorkshire course and the great weather on the day. We hope to see you all again in 2020. The next Huddersfield 10k will take place on Sunday 23rd February 2020 at Huddersfield Rugby Union Club, Lockwood Park, HD1 3UP and we will be opening for entries in early November 2019. We are an outstanding value for money race with an entry fee of £12 for ARC/UKA affiliates or £14 unattached, a prize list and technical t-shirt for all finishers. Prizes to first five males, first five females, winning vet. categories and first three teams. Prize list totals £1,500 with first place cash prize and Run Direct vouchers. The Huddersfield 10k uses disposable chip number timing. The race numbers and chips need to be collected on the morning of the race. Entrants providing a mobile phone number will receive a text message with their race result. The course is undulating - what do you expect in the Pennines - but with a fast finish! Course record for males is 32:28 (2013) held by Mohamed Aburezeq of Altrincham & District AC and for females is 36:07 (2002) held by Rowan Smith of Scarborough AC. There is a £100 bonus for anyone creating a new course record (male and female). Marshals are withdrawn in line with a 12 minute mile pace. Changing rooms and showers are available for use. On race day there are hot drinks and bacon butties available and the bar is open afterwards for runners to enjoy a well earned drink whilst the presentations take place. Run Direct of Barnoldswick will again be present with their race shop. Results will be available shortly after the race on this page and on www.ukresults.net. Safety cover for the Huddersfield 10k is provided by Holme Valley Mountain Rescue. Click on the link below to view the Huddersfield 10k course. Click on the links below to open and view race results. You will need Adobe Acrobat Reader to see some of these files - download it here for free.